This episode finds the gang discussing engineering projects that went awry, but did not result in the loss of human life. While map makers include trap streets to catch copyright violators, Adam reassures us he’s never been asked to physically construct such a street. It seems that mapping software sometimes makes traffic worse. At the turn of the century, computer programmers had to deal with the lack of a four-digit year field. This was known as the Year 2000 problem, or Y2K. Carmen learned of Y2K from Nick News, which featured Linda Ellerbee. Computers will face a date problem again in 2038, when a signed 32-bit integer can no longer store the number of seconds since January 1, 1970. Brian shares the story of a drilling accident at Lake Peigneur in Louisiana. We learn of Carmen’s adventures when learning to measure line transients at work. Carmen also shares some information about active and passive oscilloscope probes. Jeff relates the near loss of Space Shuttle Discovery in July 2005, as told by Wayne Hale, a former Space Shuttle Program Manager. The Mars Climate Orbiter is mentioned by Adam as having been doomed by unit conversion errors. Please don’t take our comments about “freedom units” seriously… we’re just joking. A hogshead is a liquid volume equal to 63 gallons, or about 240 litres. In comparison, a cord is a unit of dry volume used to measure firewood in the United States and Canada, occupying a volume of 128 cubic feet, or 3.6 cubic meters. A missing hyphen led to the loss of the NASA spacecraft Mariner 1, launched in 1962. Brian mentions the process of metrication, a conversion to metric units of measure. Confusion over whether pounds or kilograms of fuel had been added to an Air Canada 767 caused the aircraft to lose power at altitude, and to be forever known as the Gimli Glider. We learn about the USS Yorktown being incapacitated for nearly three hours in 1998 when a crewman accidentally entered a zero into a data field, resulting in a buffer overrun. Carmen describes the panic he experienced when his first evaluation board wouldn’t work… and his relief at discovering the problem was a layer omitted during integrated circuit fabrication. Jeff describes how the Kansai International Airport, built in the middle of Japan’s Osaka Bay, is sinking into the ocean. Tilting of the Leaning Tower of Pisa was stabilized during a restoration between 1990 and 2001. A giant concrete test load, known as a Schwerbelastungskörper, was built by Albert Speer in 1942 to determine the feasibility of constructing large buildings on Berlin’s marshy ground. 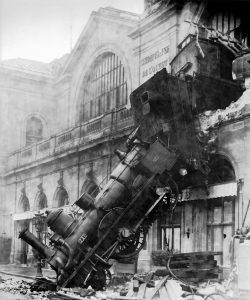 Thanks to Wikimedia Commons for providing the public domain photo titled “Train wreck at Montparnasse 1895.” Opening music by John Trimble, and concluding theme by Paul Stevenson. Great show guys – I love listening to stories of real world problems and solutions. Best episode ever! I’ve been listening for a couple of years and this one stood out. Great! Particles can travel faster than light in a medium. Look up Cherenkov radiation.